How does K-TIG compare to TIG/GTAW? K-TIG is a high performance, full penetration variant of the TIG/GTAW process. Conventional TIG/GTAW is a melt-in process. Surface tension causes the molten metal to circulate, moving the heat first to the sides and then flowing to the bottom of the weld pool, before returning to top centre of the pool. This results in a broad, shallow and typically turbulent weld pool. Conventional TIG tends to be restricted to currents below 250 amps because higher amperage causes distortion and depression of the weld pool surface. Generally this is unstable. Unlike conventional TIG welding, K-TIG deliberately maximises the arc pressure to provide the punch to penetrate the materials being welded. The energy is derived from higher than conventional welding currents. Currents range from about 320 to 600 amps, and occasionally higher for very thick materials. Once deep penetration is achieved, the K-TIG process is able to open up and maintain a highly stable ‘keyhole’. The sides of the pool act like an elastic membrane attached to the top and bottom openings in the plate and the result is that the cavity spontaneously converts to a self-stabilising structure. This makes the K-TIG process highly efficient, as it melts the minimum amount of material necessary to achieve full penetration, whereas with conventional TIG/GTAW most of the energy is wasted. Joint completion times are typically reduced by 50x to 100x relative to conventional TIG welding. 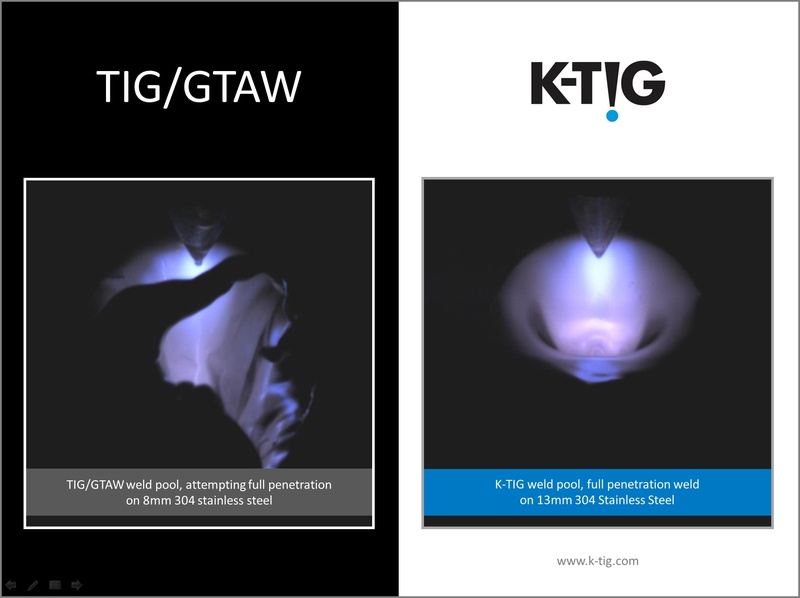 In both TIG/GTAW and K-TIG, only one gas is associated with the actual welding process. This is delivered as per conventional TIG, flowing down between the electrode and the gas cup. How does K-TIG compare to MIG/GMAW? MIG/GMAW is a welding process in which an electric arc forms between a consumable wire electrode and the joint, which heats the workpiece metals, causing them to melt and join. GMAW is a low penetration process which requires extensive edge preparation and consumption of filler material. It is commonly used for welding carbon steels and stainless steels but is generally unsuitable for more exotic materials. By contrast, Keyhole TIG is a full penetration GTAW process which uses a non-consumable electrode, eliminates or minimises filler consumption, and is suitable for most industrial metals and alloys. How does K-TIG compare to Submerged Arc Welding (SAW)? Submerged Arc Welding is a process which requires a continuously fed, consumable, solid or tubular (metal cored) electrode. The molten weld is protected from atmospheric contamination by being ‘submerged’ under a blanket of granular flux consisting typically of lime, silica, manganese oxide, calcium fluoride and other compounds. When molten, the flux becomes conductive and provides a current path between the electrode and the work piece. In suitable applications, SAW can achieve high deposition rates however root passes are generally not achievable. By contrast, the K-TIG process has no consumables, requires no flux handling systems, creates no flux or slag residues, requires no inter-pass and post-weld slag removal and provides a high-quality root bead. How does K-TIG compare to Laser Beam Welding (LBW)? Laser Beam Welding is a welding technique used to join a work piece through the use of a powerful laser. The beam provides a highly concentrated heat source, allowing for narrow, deep welds and high welding rates. High powered lasers capable of penetrating medium and heavy gauge materials are available, but their cost is prohibitive for most applications. Laser welding has virtually zero tolerance to irregular fit-up. K-TIG is similar to laser welding only to the extent that both processes can open a ‘keyhole’ through the full thickness of the joint. K-TIG achieves this at a small fraction of the cost of a laser welding system and requires no specialist skills to operate it or maintain it. K-TIG is much more tolerant of irregularities in fitup. How does K-TIG compare to Hybrid Laser Beam Welding (HLBW)? Hybrid Laser Beam Welding is a more complex variant of Laser Beam Welding and combines a laser with an additional arc welding method such as MIG/GMAW. Such combinations improve the tolerance to variations in joint fit-up and allow improved weld finishes. High-quality welds can be achieved in a variety of materials. However the operational complexity and cost of hybrid laser systems is prohibitive for most applications. By contrast, K-TIG is a simple process, easily operated and affordable to the majority of fabricators. How does K-TIG compare to Electron Beam Welding (EBW)? Electron Beam Welding (EBW) is a fusion welding process in which a beam of high-velocity electrons is applied to the materials being joined. The workpieces melt and join together as the energy of the electrons is transformed into heat upon impact. EBW is performed in a vacuum, has high capital and operating costs, and is generally used only in highly specialised applications. By contrast, K-TIG operates in normal atmospheric conditions in any environment in which TIG/GTAW is used. How does K-TIG compare to Plasma Arc Welding (PAW)? Plasma Arc Welding (PAW) was developed in the 1960’s, and until recently was the only practical choice where deep penetration welds were required. While good quality welds can be achieved, the practical upper limit for full penetration PAW welding is 8 - 10mm (5/16 to 13/32 inch), and is more typically used for root passes of 4-6mm (5/32 to 1/4 inch) followed by filler passes using TIG. Plasma Arc Welding is characterised by a requirement for an orifice to pinch the arc, very accurate alignment with the electrode, frequent maintenance, high level of complexity, the need for both plasma and shield gases to form the jet and protect the orifice, very accurate determination and maintenance of flow rates, low inherent stability of the keyholes due to reliance on a combination of gas pressures and energy density to achieve penetration, high degree of sensitivity to the many parameters involved, highly precise fitup and high degree of operator skill to set up, operate and maintain. PAW is widely regarded as the most complex of the arc welding processes. PAW systems incur the highest maintenance costs of any arc welding process due to their complexity. By contrast, K-TIG can weld materials up to 16mm in thickness, and typically operates at twice the speed of PAW. K-TIG is very simple to operate. The arc structure and keyhole develop spontaneously and are maintained automatically by the controller throughout the weld. There is no plasma nozzle or orifice, no precise electrode alignment is required, only one welding gas is used, flow rate is not critical, and the torches are very robust. Be a hero in your organisation. Book a live demonstration to see what K-TIG could do for your company.